If you have not launched your product yet and/or are considering Udemy to sell your online courses, please pay attention. As a result, you have to sell a lot of cheap products to make worthwhile money, and you often end up with a less engaged student due to the low risk/investment. Many instructors feel trapped and obligated to participate in the Promotions because without them, they would hardly make anything due to the fact the students look for the discounts and they don’t have an audience. This may be hard to believe, but I don’t care about high enrollment numbers right now. Giving products away for cheap is NOT the answer for me. This topic was so important that I decided to also do a podcast. You can listen below or right-click this link and download the mp3 file here. He did similar with the App store and Itunes. Udemy can still be a good platform if you specifically Design courses that are worth only $15 to $30 bucks. Or you can break a large one down by module and sell a subset. I know most people who have been following you really don’t care what you sell your courses for because they know it is going to be good. What happens is that DISCOUNT has taken over the psyches of shoppers. People will see an item for $1000 and walk away if the seller doesn’t offer it for $999.99. It maybe that stores like Walmart has built a discount phenomenon in this era. Walmart made over 100B profit last year selling itself as the biggest discount store. I see items in Walmart selling at so called discount for $1.50 that you can get at Dollar Tree for $1.00. I believe the discount mentality is more of a new way of life more than it is about money. Even millionaires are looking for discount when they buy fur coats and Mercedes Benz. Just my take. Very interesting info in both the post and the comments, thank you! I had only explored Udemy up until this point, but based on the comments, I’ve got a few other places to check out now. Awesome! The discount mentality isn’t just with Udemy, it’s prevalent in many niches online – people expect and like deals. And I can’t really blame anyone for that. However, how you presented yourself and your products to those that were asking for discounts was great! And something that I’m going to have to remember to do moving forward. Thanks for all the great info and tips! So true! Just for the record I am VERY happy with Thinkific. I am on their yearly plan and pay $39/mo. Many of my students who bought my Udemy courses had no problem paying nearly $200 for my package and I was so encouraged by that. Good luck, Bobbi! I am planning to start with Udemy. Discounts are actually important for newbies on Udemy. May be it’s not that important for people with enough students. Option should be given to stop discounts on courses that we don’t want. That is something I wish they would offer. Unfortunately it’s either all or nothing with your courses. I have a teachable account but it’s a free one. i’m considering to upgrade. I left Teachable before I launched my courses for http://www.passiveshirtprofits.com. They don’t have phone support and I had an issue during testing and I had no idea I couldn’t call anyone until that happened. Thinkific’s support is much better and they are friendlier overall. I have not visited your site for a while. Today I observed that your site has no adsense ads. Why? I thought you’re one of the inspirations for me to consider AdSense to make living online. May i know the reason behind it. Isn’t it your major earning tool these days, or earnings are down and you removed them? I heard that you earn $5k+ every month from AdSense. Then why did you remove them? May I know your approximate monthly earnings from AdSense? My site is going to get 2000 unique visitors every day (Total views would be around 10k from those 2000 people). With this traffic, can I earn $300 a month from AdSense (on average $10 per day)? Please reply me and suggest me, and pardon me for posting this in a non-AdSense related post. Ravi, I haven’t had AdSense on this blog for almost 5 years (if not more). I still have a few ads on my main site but I stopped focusing on AdSense a long, long, long time ago. $2,000 would be a good month for me now but I am making money so many other ways that it feels good not to focus on AdSense and still make a nice full time income. AdSense was great for starting out but there are so many more stable ways to earn online. I took many of the ads off and prefer to promote my courses and affiliate links. Much more profitable for me in the long run. This comment is more directed toward your new course/platform! I also am planning to launch my site/course and I’ve been convinced to use Teachable lol. 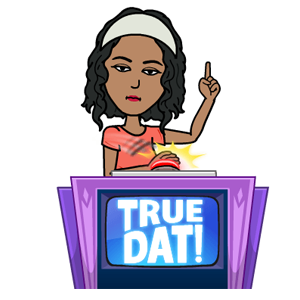 I’m attracted to them because of the panel summit’s they have where they invite many of their most successful course creators to give a webinar teaching on many varying topics! I noticed you raised the point that some people are attracted to Udemy because of their low pricing (course buyers). However, most people don’t realize that one way to help those who can’t afford the price of your course in full is to offer monthly payment installments as an option when they purchase! I think this helps maintain the quality of the course and also helps those who truly want to take the course. what’s your take on that? do you think that monthly payments will make a difference in terms of sales and encourage those who can’t afford the entire price to get the payment plan? I actually just left Teachable today and glad I did before launch. I am on Thinkific now and that’s where I was going in the first place after speaking to their owner on the phone, but I got suckered into Teachable because that’s where everyone else is. Just understand Teachable does not have phone support. That may not be a big deal to some but it was to me when I’m paying monthly. My school was down yesterday for 4 hours. Thankfully I’m not live. When I finally heard back they said they couldn’t replicate the issue. Then they realized it was a CDN issue fixed it. Four hours is not that long for minor problems, but it was an awful feeling for those 4 hours when I realized I had to wait on an email and couldn’t call anyone. So just be aware of that. There are a lot of complaints online about their support but it does seem they are aware and working on it. Now, back to your original question. Yes, I do believe that offering installments is a GREAT idea. However, in Udemy’s culture people are locked into the cheap course mentality (and who could blame them) so it won’t make much difference to people who are trained to buy cheap courses. However, on another platform like Teachable or Thinkific I think it’s a GRRRREAT way to offer another affordable option to those who can’t afford a one-time fee. Indeed! But there’s a difference between can’t afford and just won’t pay. With Udemy, due to the discount expectation they’ve setup, it’s more about people just not wanting to pay due to the expectation vs cannot pay because it’s too expensive. Great question! I am a customer of Udemy and it isn’t the regular prices that is stopping me from purchasing courses at regular prices. It is the information or should I say the lack of information most of the courses provide. I have had courses with literally five six videos that were about two or three minutes long. And regularly this person wanted 50 dollars for this course. At ten dollars this course was still over price with no information. I have taken other courses that had old out date information but the instructor just released this course. Still other courses are just thrown together with basic information not covering what they say they offer. These courses were regularly priced at 150 dollars. So not all of the Udemy customers take the courses because they are cheap. We take them at this 10 discounted price because the regular price of these courses are three times the amount of the value your getting from these courses. I haven’t bought a course in a very long time. I think it has been about a year. I got tired of the junk even for 10 dollars their not worth what your paying for. Too many people got on the Udemy kick and produced junk and charged good money for it. And lets not forgot the disappearing course owner. There are so many abandoned courses it is ridiculous. So these are the main reasons so many people including me stopped buying these courses at regular prices. Instead of constantly giving those discounts, Udemy should have tightened up the qualifications and got rid of those no good courses and built a platform of Courses with value and then people would have been wiling to pay a regular fee for the courses. Oh and yes I like a discount because it saves me money but this isn’t the main reason why I don’t buy courses from Udemy. There is a lot of over priced Junk and abandoned courses that are not worth the full price. Now THAT I will agree with as well. And that’s what happens when people are making so little per sale. They aren’t motivated to add to their course or keep it updated. So it’s an endless cycle that creates a lot of low quality courses that sell cheap. At the end of the day, no one wins (well except maybe Udemy and the small percentage of instructors who the model works for) You just stated as a customer you are tired of low quality courses so that reflects poorly on Udemy too. I agree about quality control. They need to go back to how they operated when they first launched. This whole discount mentality cheapens the whole platform. But you are right. Course creators have to do their part too, which is why I added that part in the post. It’s a two way street. Lisa, I can personally vouch for this. I have been a customer of Udemy for a couple of years now. Most of the courses I bought were at a rock bottom price, and now I will not pay a higher price because I feel like I should pay the price I paid when I started. I see coupons come through with discounts about courses, but ebcause they’re generally more expensive than what I am used to paying, I am reluctant to make the purchase. I never really thought much about this until reading this post, and it is sooo so true. Long-term discounting isn’t good for long-term business and it also devalues your product. Thanks for sharing this post, and I look forward to seeing more from you in the future. Really enjoy reading your valuable content! The fact that you are a customer and can even admit this speaks volumes! Of course it’s great for customers but it’s not good for instructors trying to grow. It never makes sense from a business perspective to keep adding to your product and only get the same amount per sale. That’s now how business should work. So thank you soooo much for chiming in from the customer side. I can see where you’re coming from but I thought I’d add my 2 cents (or tuppence) worth on this whole debate. I’m not saying you’re wrong to leave Udemy and definitely not to opt-out of the discounts because that seemed to work for you. As you know, I got into Udemy fairly early and did quite well – well over 6-figures now and I know I couldn’t have made that from my own site. I also sell on other platforms as well as my own site now. OK I know Udemy got me into bad habits and I really don’t like to price courses higher than $99 and on my own site most of them are closer to $25. – I hate, hate, hate, guru courses and programs that have expensive marketing campaigns and urge people to pay $500-5000 (I’m not kidding) promising them riches (from podcasting and Amazon FBA. Podcasting? Really? Yes). And pretending that they can only get them at this price for a few days when it’s on an evergreen email sequence. People miss house and car payments to buy these courses because they think they’re buying something that’ll get them out of a hole when it won’t. I know you never did anything like that, Lisa, but I’m glad I can sleep at night and that I never did either! (OK I’ve probably gone too far the other way). – I have tested this on my site and launched courses at $9 and at $49 (both launch discounts) and guess what? I made more or less the same from both (although 10-15% higher on the higher price). – I really don’t get many organic full price sales on my site or on Udemy. That’s because I’ve trained my audience to expect discounts. Anyway, I thought some of your audience may be interested in this comment to see the “other side”. Well, it’s not really the other side because I think I went too far into “Udemy culture” however, looking back, I’m glad what happened as it worked for me for a certain period of time. And, I’m moving on into other things now. As you are. Yes, the Udemy culture has definitely changed since you started. I hear what you’re saying about misleading guru pricing but that is an extreme, filthy tactic that I would never dare participate in. It’s about finding a balance between what’s fair and affordable for students and profitable for me in the long run. And I just don’t believe Udemy’s structure is profitable in the long run for most people. If I felt I was getting out of it financially what I was putting into it (work wise) then that would be a difference story. To your point about $500 courses… There are people out there selling really expensive courses that are worth the price. I don’t have a problem with the price as long as the instructor is upfront about what their students will learn, and doesn’t mislead people in any way. That’s the difference. It’s about finding that balance and I honestly don’t know what that price looks like yet. I’m still looking for the “sweet” spot. I seriously doubt it will be as high $500, but it’s not $15 either. And you’re right. It’s nice that it allows people from other countries to afford a course, but I cannot ignore the work that goes into creating it and continuously updating and adding new content, only to earn the same amount. One guy emailed me last year and told me he almost didn’t enroll in my affiliate course because it was “priced odd”. He saw my discount for $30 and the regular price at $90 and he said it looked like a scam. He ended up taking the course, said he loved it and would have paid more than my actual retail. Then he reminded me how heavily discounted products can turn people away too. I never thought about it from that perspective. So as I said, I’m a work in progress with all this. I have no idea what the right price is for me yet, but I will be experimenting. You did not mention customer support. You may sell more courses at lower prices but you may have to do more email and refunds or other customer service for much lower income. Time is an asset. I prefer to give more time to the person who paid $99 vs $10. That should also be taken into account. Do you agree its the same as PAY WHAT YOU WANT? I think its the same personally. You are either a business or a charity not both. Same as crowdfunding etc in the long run not a good business model. Exactly and I’m not a charity. I’ve done a lot of “free work” for people over the years and will continue to do certain free things such as blogging, youtube videos, etc. But when it comes to selling a product you put lots of hours into, you have to ask yourself if you’re getting out of it what you’re putting into it. And with Udemy, I was not in the long run. Maybe I’d feel differently if I could consistently grow my course income selling at $10 (LOL) but it didn’t work that way for me, and I thought that selling low was the way to go. But I was not growing my income with that model and I didn’t like that I was setting a proverbial price ceiling on my hard work. I ended up competing with more course creators also selling for the same price and then my own audience (even if they paid full price) often felt the remaining courses SHOULD be priced cheap because they are on Udemy. So they’d ask for coupons for the other courses just because other Instructors give them. Here I am constantly updating the courses with new videos and content and still expected to sell it at the same price? Nope. Something’s very wrong with that. And my income was not a reflection of the work I put in. THAT is the real problem. It’s about finding that middle ground. I don’t think you should rip people off as Rob said, that’s a completely different issue. But you should find the right price that helps you grow your income and reward you for the work you put in. Otherwise you end up working harder for less income. Nah… I don’t want to play in that playground. Pricing really have no formula. There are certain strategies but it is ultimately you to find the right price strategy to work for you. Your observation regarding discounting is excellent. Points are noted! As I know, Udemy is a wonderful online learning and teaching marketplace and I have browsed about five of paid and free courses for learning computer programming languages. I really like this. You are right, courses with affordable price are best for people to learn and I hope you achieve your goal fast. Thanks for sharing your experience with us. I have learned many interesting things here and this is going to be useful for me in coming time. The irony is those people that sought out the cheap price would NEVER work for that same amount. My goal for my courses is to help people. However, I’m also a firm believer that I should get paid for my knowledge. I think people lose sight of the fact that they are paying for a shortcut. Time is more valuable to me, so I’m going to cough up the money and take the shortcut if I feel that course creator knows their stuff. You provide EXCELLENT value. If anyone has a problem with your desire to make a living wage, I would definitely count my lucky stars that I don’t have to work with this person. It’s their loss, not yours. If you don’t mind me asking, are there specific reasons why you chose Teachable over Thinkific? I ended up going with Thinkific for my courses due to their customer service and their amazing supportive Facebook group. 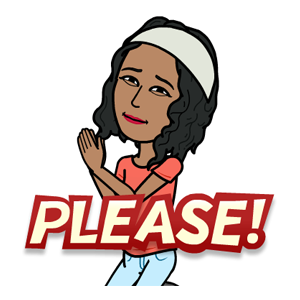 When I was originally going to use Teachable for my courses, I tried 3 different times trying to get Thinkific’s customer service attention to answer my questions. Teachable got back to me on the third try…almost 3 weeks later (literally). Very, very well said. Such great points. I almost went with Thinkific after speaking with their nice co-owner on the phone, but ended up going with Teachable after speaking with several people who use them. I did hear about their support so that was a bit of a concern but ended up choosing them anyway. The reason I was going with Thinkific at first was due to bundling. At first Teachable wasn’t offering multiple bundles. But now they are so I decided to go with them since that was a feature I needed. I should have followed my first mind. And shame on me because I researched this and spoke to a customer rep at Thinkific and STILL chose Teachable out of peer pressure (everyone’s using it). Well the dashboard has been down for 4 hours now and NO one on their FB page or Twitter is responding. How do you not have phone support? I’m sooooooooooooo glad I haven’t launched yet. I’m moving to Thinkific like I originally planned and not looking back. Bye Teachable! Good riddance! 1.) I need a phone number. If I’m paying to be on a platform, I want to have the option to speak with someone live if something goes wrong and/or if my ticket has not been addressed (something that has yet to happen). ALL of my tickets have been acknowledged so I never needed to “follow up.” I have only called Thinkific’s support desk one time, but that was because I needed an answer right away (I was in the middle of coding and didn’t want to chance “remembering” where I stopped at). 2.) I don’t feel like I should have to chase people. I tried contacting them three times to ask one question. It literally took them 3 weeks to answer one question. Thinkific got back to me the next day. Enough said. Thanks for sharing that! Someone else just told me Thinkific has had issues with downtime. I’ve seen that a few times online. Have you experienced this? Now I don’t know WHAT to do but the fact this company has ZERO phone contact or at least live chat really bothers me. Maybe I need to do a blog post and just welcome feedback from other users. They did end up fixing the issue in a couple of hours but I was frustrated by lack of phone support. No one is going to be perfect (I wish lol), but I’ve been with Thinkific for a couple months and I can honestly say that I have not had any issues with Thinkific. There was one time when over half of the internet was down, but even then, Thinkific was on top of it and giving us updates in the Facebook group where they were in the process of restoring their systems. That situation could not be avoided and they handled it like professionals. The only other times I have experienced them having downtime is because it was planned due to upgrading features or fixing glitches. Plus, if they are having maintenance they tell you in advance. You don’t have to guess. It doesn’t affect me because I’m usually not working on the platform in the evening during the times that they are conducting maintenance. So for example, they are redoing their theme editor so they notified people telling them the exact hours that they will be experiencing some downtime (it will be tomorrow evening I can’t remember the times). You have to take into consideration if someone is complaining about Thinkific’s downtime if they read their emails and the updates that are located within the Thinkific’s system. I have seen times when other people complained about their site being down, but my site was fine. Regardless, if you put in a ticket or call them, you can get your issue resolved right away. Just had to come back and say I am loving Thinkific! So glad I made the move before I launched. Thanks again! No problem! I LOVE them as well! I’m working on my third course using Thinkific and they are making some amazing upgrades to features that we have all requested in the FB group (make sure to join that group if you haven’t already) or via the contact us page. Happy course creating! Cool! Yep I’m a member. Need to pop in and say hi and see what’s up. Thanks, LaTosha! Hey Lisa, Great post, they are getting better all the time! Hey I have not seen a post from you for some time, I was wondering if you are not posting weekly or is something wrong with my connection. Thanks again, I always enjoy your work and tell my customers that I am sorry I can’t be the cheapest guy in town….. Thanks James! Yes, I’m still here. Just really busy with my T-shirt biz and working on a new site/courses for that. Thanks for stopping by! Make a lot of sense, when we try to serve people that constantly checking out for discount and begging for discount, it devalue our services and effort, making it a cheap market to gain something. Definitely not something we want in building a long run business. Serve less but higher quality customers, and both businesses and customers will gain much more quality services and value. Thanks for great sharing again! Spot on. I left Udemy, too, for the exact same reasons. Back when they announced that that the maximum price for courses would be $50. They changed their mind since then, but I was done. Although I’m still keeping my courses there for existing students. I also opted out of all their promotions. What really bothers me is that on my course sales page they advertise other similar courses that are on sale! Who in the right mind would purchase a $95 course, if you can get a similar looking course for $10 advertised right next to it? Exactly. The pricing just looks strange all the way around but it works for THEM, not for me. Great stuff as always Lisa. I haven’t struggled with the products thing yet, but as an independent consultant I can totally feel what you’ve said here. When the economy tanked back in ’09 there were lots of consultants who accepted whatever money they could get, which drove down the rate the rest of us were used to getting. I had hospitals with major projects wanting to only pay $25 an hour to travel to large cities when I was used to getting way more than that. I turned them all down; no way I was going to make less money than I did when I was an employee. Good for you for holding firm Mitch! Yeah, there are a handful of instructors getting out of Udemy what they are putting into it, but most begin to realize the hole they’ve dug themselves into after some time. There’s nothing worse than another company determining what your product is worth. That should be up to us the owners. Thank you for this article! Apple computers comes to mind when I think of higher prices and no discount. Those computers do not go on sale (at least, I have not seen them “discounted”) and I see why. The quality of my MacbookPro was worth the higher price. I have had it for 7 years, and it works like a great! A race to the bottom is exactly what it is. I don’t want to run in that race. There will always be some who will win at that model but most will lose at the end. It’s just not good for business. Lisa do what works for you with all u do 2 help people and all the work that put n it waiting on the101 print demand course when it is available to us keep on BLESSING US AND U IS A BLESSING 2US AS WELL. Right ON with this post and podcast Lisa. I am not going to lie, I’ve struggled with pricing my courses for a long time. Now I am working with a mentor who is putting me on the right track with the way that I am going about things. He has pretty much summed up pricing to one key thing: Mindset issues. And to be honest, I could not agree more with him. As you stated in your post, the right people will value what you have to offer and don’t mind paying premium prices for your courses. In fact, pricing will REPEL the wrong people and attract the right ones. As always, loved reading this post (and listening to the podcast version of it too). Looking forward to hearing more about your new site chica. I agree about mindset. I personally had a deep-seeded fear of criticism for pricing too high. I don’t worry about that anymore as long as I’m doing my part. As you said, it deters people who aren’t serious about the work. Then I started to realize when I opted out of the discounts, that I attracted a different kind of student who was more committed and took more of the course, asked questions, followed up and in many cases bought my other courses at the price I offered. I also think because I’ve been praised for doing so much for free over the years (video, content, etc.) I was worried about letting people down by making my work products expensive. But I have to also take into account my work. Maybe I’d feel differently if I could make $20,000 per month selling at $15. LOL But it doesn’t work that way. I’d rather just price what it’s worth and attract the right people. Hey Lisa!!! Long time no see, I’ve missed you and the gang over on NC! I still see many of them on IG and via text, but I had THE most fun time while I was there. Thanks for providing such a wonderful platform for naturals to interact and learn from each other! Back to the subject, it’s funny that I’m taking (free) Udemy courses right now. I was really tempted during the recent $10 sale, but I have so many things on my plate, and honestly didn’t even want to pay that small amount just to be overwhelmed. Plus, as you said, they’ll be $10 again! Neeeeeeeeecey!!! Oh my goodness! Long time no chat! So good to hear from you. Thanks for sharing your stance from the student standpoint. Like we’ve both said, not EVERYONE is locked into that cheap mentality but a lot of people are. I didn’t realize that when starting with Udemy and plus they weren’t training their students to expect discounts like they are now. So great to hear from you! Hope you had a fabulous Easter! You’ve raised some excellent points, Lisa. So glad I read this. I haven’t created any online courses – but if I ever do, I’ll remember this principle. Great Post. i have ditched Udemy long time ago. And Now i’m happy with Teachable and Rain Maker platform for selling my course and no worry about anything. No plugins, No hosting. I’m wondering which service do you use for selling your online courses? I signed up with Teachable last month and that’s what I’m going to be using too. How do you like Rain Maker? I’ve heard mixed reviews. The Rain Maker is great for all in one service but if you are not a programmer or at least don’t know HTML and CSS then you are lost. because the design is a headache. At First i was hesitant about services like Thinkific and Teachable but when i saw billion dollar companies like Hootsuite use them. i was relieved. I felt the same way. I was hesitant but it seems so many use them. I have the $39/mo plan because I want to use my own domain. I’m happy with them so far. Thanks for sharing your info about Rain Maker. Good to know! Thank you for this article. When Udemy dropped their prices, I was wondering how it was going to affect them. Lo and behold, I believe there was numerous instructors that walked away yet many stayed on. I believe more instructors will leave Udemy. $10 and $15 courses for hours of very detailed and thought-out work seems disrespectful to the instructors. True words, Larry. Yes many people have left — especially after all the pricing changes last year. I hated how I felt I had little control over what my courses were worth in the eyes of most. A lot of students don’t get it. One lady asked me why I didn’t offer coupons and she said if I sold it for $10 I’d sell so much more. And my response was “yes, but I’d have to sell 10 times as much to make what I’d earn with one sale. So why not price what it’s worth? 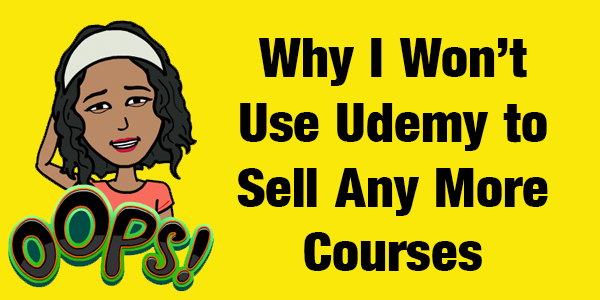 Some people feel stuck at Udemy because they can’t get sales themselves. I’m not the best at marketing either but I don’t care. I’d rather control my own prices instead of using their schemes. Yes. I’ve noticed all the emails I get from Udemy announcing the start and end period for courses. It’s quite frequent. I would see the $15 sales would end, however I’d just have to wait a few days and the same sale for the same courses are back up for $15. Exactly! So why would you ever pay more for a course if you know there’s a discount coming? So why would that motivate a course creator to keep adding value if there is a ceiling for what you’ll earn? Sorry, not a game I want to play. I agree with everything you said. I have purchased many cheap courses with udemy and am overwhelmed about where to start. I have purchased and completed some of your courses and the content is very rich. I think I will focus on your courses and yes I will follow you over to teachable.